Very*Berry Oxygen Masque & Scrub contains the best of the both worlds, the world of beauty and youth, that is. It combines 2 products in one. It is a very gentle skin exfoliator and it is also a masque that cleanses your pores, drawing out impurities and just perfects your skin, feeding it with essential components for it's youth and health. Containing 10 super berry/fruit ingredients, it even resembles the scent of berries, that can be treated as aromatherapy, making you feel happy and relaxed. Plethora of vitamins and antioxidants will rejuvenate your skin in no time, making it feel like new. High content of Hyaluronic acid will put moisture back where it belongs, while Papaya and Pineapple help to slough off dead skin cells, reviling fresh rosy glow. Very rich in Vitamin C it also helps to repair and lighten up sun damage and sun spots. Honey's natural antioxidant and antimicrobial properties help to protect the skin from the damage of the sun's rays while supporting the skin's ability to rejuvenate and refresh depleted skin. It helps to absorb impurities from the pores in the skin, making it an ideal cleansing agent and fighter against acne. Directions: Take a small amount of scrub/masque (about a quarter size) from the jar and spread between your fingers. Following circular motions apply on your face and gently massage, avoiding eye area. If a thicker layer desired for a masque, you can apply more. Leave for about 5-10 minutes, and then rinse off with cool water. Follow with moisturizer. After use your skin may be slightly pink. It is normal. For best results and better penetration of other products, we suggest to use it at least twice per week. Warning: Use only as directed. Do not ingest. Keep out of reach of children. Discontinue use if irritation occurs and persists. How often am I supposed to use it? We suggest to exfoliate 2 times a week, but you can use it as a hydrating masque as often as you like. Does it help to shrink pores? Pores do not change in size, but exfoliating and properly cleansing your skin will clear the pores too, which in return will make them look smaller. I use this scrub every morning. I love the way it makes my skin feels. Some days I leave it on a little longer to use as a masque. Love the way it smells! I do this mask every week .. After a long work out or just to detox your face, this is the main product that keeps my face refreshed and clean. I highly recommend this mask . Plus it smells great ! I became a fan of Sweetsation a few months ago when I had the opportunity to review and test out I-Organic Brightening and Line Smoothing Treatment. Once again, Natalia has proven once again that Sweetsation is an amazing experience at home - and brings the spa right into your own bathroom! I promise I won't eat it, but the Very Berry Organic Oxygen Masque & Scrub smells more like light chocolate than berries. It comes with a spoon applicator to blot on your face, however, I just dive right in and use my fingers to dab it on either cheek and forehead. Rub it in using circular motions until it has covered your whole face, and wait about 10 minutes for it to dry. While drying, it doesn't tighten up my face, and I honestly forget that I'm wearing a mask. It's light pink, so it is barely noticeable that I am wearing a mask, hence I don't terrify husband with it like I normally do with my face masks. I love to use masks twice a week and treat myself to an at-home spa regimen, as I work doggone hard and deserve it! It rinses off quite easily, and afterwards - my face feels so soft and smooth. I even noticed that my skin tone is even immediately after rinsing and drying - sweet! Normally masks leave my face feeling dry and it requires immediate moisturizer to bring it back to its normal soft young appearance. The mask itself uses Hyaluronic Acid (very popular in anti-aging products these days), papaya, and pineapple to rid your skin of dead skin cells, and the Vitamin C brings back an even skin tone. It contains natural antioxidants, but also does not cause my skin to break out (which has happened with some antioxidants that I've put on my face before). It does smell more like chocolate than berries, but I won't hold that against it - it is not an overpowering scent once applied to my face. Overall, I feel this is a great value for the size of the container - it should last me quite a while due to the easy and efficient application. At the end of just over 10 minutes, I rinsed off my face. Although Very Berry doesn't have the mint tingly feeling of Magnaminty, it definitely leaves my face feeling much softer and less itchy after use - the overall results deem Very Berry as the leader, since I can use it multiple times a week without drying my face out. Magnaminty is a once a week maximum mask due to it's power and drying effect. I am glad there are other natural North American skin care products that leave me feeling good about what I am putting on my skin (hence inside my body). I am looking forward to more Sweetsation products coming out in the future! Love this masque and the other products from this company! Have purchased multiple times! Smells and works great! This mask is like putting summer on your face. It is cool, moisturizing and I notice a huge difference. It literally makes your face glow. It also smells amazing. The smell is not overpowering like a lot of chemical masks. It is very creamy and it is like a two for one with an aromatherapy facial. I use this whenever my skin needs a little extra because of weather or environment. Can't go wrong. I've been using this scrub for a couple of years now and it leaves my skin feeling clean, soft, and moisturized. Plus the product itself smells great and is made from healthy ingredients (low toxicity and low risk for adverse side effects, as I have extremely sensitive skin). 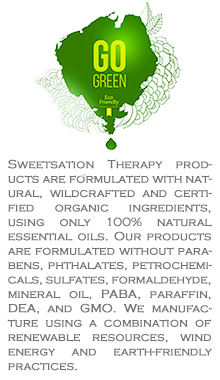 I discovered the Sweetsation brand years ago while researching skin care products that were approved by EWG's Skin Deep website. I've been a fan ever since! I bought this when I purchased a few items for my 2 and half year old, the baby cream and lip and face balm. I love this scrub! I have used drug store scrubs for many years and they always dry my face out. After I use this scrub my face is hydrated and so soft, I look refreshed and overall just a youthful healthy look! I haven't used it as a mask yet but I imagine it's fantastic. This was a great find and I look forward to trying other products from this company!